One hopes that the dictator of North Korea suffered greatly before he died. After all, his totalitarian and communist (pardon the redundancy) policies caused untold death and misery. But let’s try to learn an economics lesson. In a previous post, I compared long-term growth in Hong Kong and Argentina to show the difference between capitalism and cronyism. 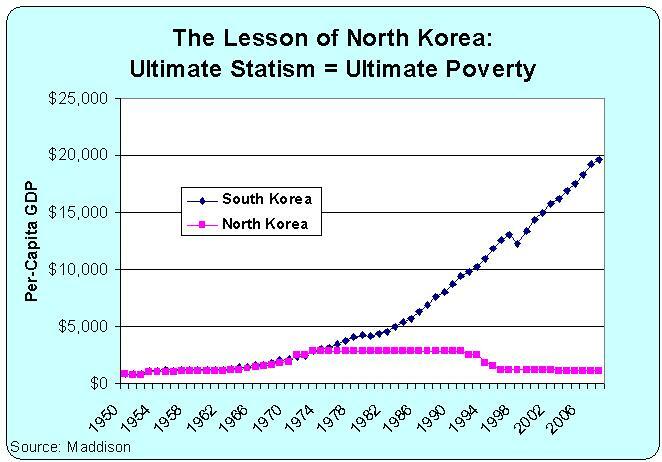 But for a much more dramatic comparison, look at the difference between North Korea and South Korea. Hmmm…, I wonder if we can conclude that markets are better than statism? And if you like these types of comparisons, here’s a post showing how Singapore has caught up with the United States. And here’s another comparing what’s happened in the past 30 years in Chile, Argentina, and Venezuela. In the longer term economic growth dwarfs all other aspects of public policy. The naive dream of mandatory compassion leads to the cruel outcome of poverty. But HopNChange is ubiquitously irresistible in the short term –to the point of arithmetic denial. So what happened in 1974/75? Things really seemed to diverge there.